*Fighting Fires in rough terrain. QUADMASTER ATV POLY TOW DUMP CART - QM-0330 *Whether the job is getting rid of garden refuse, hauling firewood, moving sand or dumping gravel, a QuadMaster dump cart will perform a variety of tasks safely, reliably and efficiently for years to come. The clean, ergonomic design and sturdy construction make these carts perfect for a variety of tasks, with a choice of capacities that can handle everything from light loads to heavy hauling. Push Pull trailer 230 kg - QM-0345 *Whether the job is getting rid of yard refuse, hauling firewood, moving sand or dumping gravel QuadMaster carts will ensure safety, reliability and efficiency in many tasks for years to come. The poly bed is quiet and it resists rust. 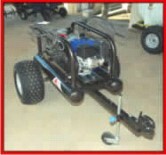 This Cart converts easily from a push cart to a tow cart by simply unfolding the hitch. The poly bed rinses clean with a garden hose. Convertible carts can be used as a wheelbarrow for hauling and dumping while providing stability and easy of use. *Offsets from 0 to 1 245 mm allowing you to maximize the cutting width. *Drawbar easily adapted so that the machine can cut while being towed by a motor vehicle. QUADMASTER ATV ROUGH CUT MOWER 1060 mm - QM-0361 Both our Rough Cut models feature dual 2.5Kg break-away blades designed to break back when striking an immovable object, while allowing the engine to keep on running. This prevents damage to the drive system and allows the second blade to chap material that may have been too much for the fist blade alone. They have chains on the front of the mower deck to prevent material from flying forward while cutting. The chains dont lay the grass and brush as the front of the mower passes over so the blades can cut all the material evenly. *Perfect for fertilizing, seeding, or applying granular herbicides. *Perfect for commercial use as capacity covers over half a hectare. (Quantities used depend heavily on type of fertilizer, and soil type. Please contact your fertilizer representative for assistance on accurate spreading rates). 60 kg quadmounted spreader - QM-0324 Broadcast spreaders cut down on the number of passes necessary to fully cover your lawn due to their wide distribution pattern (3 Meters or more). Because of their random distribution pattern, over-fertilizing and under-fertilizing are reduced. The long lasting stainless steel closure plate insures proper operation and resists corrosion. *Approx. Coverage: 2300 sq meters. 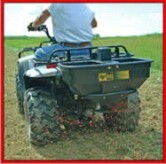 QUADMASTER ATV POLY "PRO" DROP SPREADER - QM-0288 Spread everything from fertilizer to seed and more with one of QuadMasters extensive line of spreaders. Choose tow or push models to get the job done. Durable poly hopper, coated components and long-lasting plastic closure plates resist corrosion. Positive over-center flow adjustment ensures accurate calibration. Broadcast spreaders cut down on the number of passes necessary to fully cover your lawn due to their wide distribution pattern. Because of their random distribution pattern, over-fertilizing and under-fertilizing are reduced. 12 Volt ATV Sprayer  170L - QM-0325 Quickly apply herbicide, insecticides, liquid fertilizers and other lawn products to turf, trees and shrubs. Its fast because a tow-behind gives you five times the capacity of the smaller hand held sprayers. Its easy to simply connect the wiring to your ATV battery, turn it on and spray away. 100 litre ATV mounted vertical or horizontal boom sprayer - QM-0421 This adaptable ATV sprayer attaches easily to most all terrain vehicles with a rear mounted rack. It provides an adjustable vertical or horizontal boom of up to 4200mm wide and up to 2500 high. Handgun for spot spraying. QUADMASTER ATV PLUG AERATOR - QM-0298 Use Aerators in the spring or late Autumn, whenever the lawns moisture content is high. Plug aerators remove 2cm diameter soil plugs from the lawn, allowing compacted soil to loosen up in addition to the benefits provided by a spike aerator. Best for easily compacted soil like clay, heavy traffic areas (playgrounds and sports fields), and burned out, drought-damaged lawns. QUADMASTER ATV UNIVERSAL TOW-BEHIND TILLER - QM-0308 The QuadMaster tow-behind tiller features a powerful 6.5HP engine to power through any soil conditions. With its large 90 cm tilling width and conveniently located controls, you can quickly prepare the perfect planting bed with minimal effort. 3-POINT LINKAGE TOOLBAR- QM-0353 The QuadMaster 3-point trailer allows any non-PTO Category one 3-point hitch attachment to be used on a garden tractor, ATV or utility vehicle. Using the pendant switch connected to the vehicles battery the trailer winch raises and lowers attachments without affecting the vehicles suspension. When finished, lower attachment to the ground, unplug the switch and unhitch to be free of the attachment and lift mechanism. GRADER/BOX SCRAPER BLADE - QM-0265 If youre a serious gardener, youll want to check out the QuadMaster line of heavy-duty ground-engaging attachments. These multipurpose tools are built tough and made to last. From heavy plowing to fine cultivating, youll get season after season of ground-breaking performance. DISC CULTIVATOR - QM-0356 The Disc Cultivator is ideal for breaking up dirt clods and tilling soil for seedbed preparation and chemical incorporation. It has twelve 280mm discs plus the disc angle is adjustable and reversible. For use with our 3-point trailer. QUADMASTER ATV LANDSCAPE RAKE - QM-0357 This rake is ideal for removing debris such as brush, sticks, and rocks from project areas. It is also good for seedbed preparation and giving an area a groomed look. The tines can be reversed or angled left or right for use in a variety of applications. *Adjustment: angles 24 degrees in either direction. *For use with our 3-point trailer. *Suitable for supplying quality air for the following applications. QUADMASTER ATV DRAG HARROW - QM-0390 Easily change from one mode to another by pulling from the opposite end or flipping the tines to face down. *Maintains tracks, arenas, golf courses and parks. *Tool and equipment locker beneath seats. *Base trailer converts to water Cart (see QM-0420) by removing seating frame, and fitting 500 litre poly tank. QUADMASTER ATV HEAVY DUTY TOW BEHIND LAWN SWEEPER - QM-0326 Make a clean sweep of leaves, grass clippings, lawn debris and more with one of QuadMasters dependable Lawn Sweepers. These tow-behind models make quick work of just about any pick-up task and do a thorough, efficient job the first time around. Unique design makes dumping of debris from the tractor seat easy. *Transport of water for staff or animals. *No drift so chemicals can be applied during windy conditions.